Preparing for the future is much more complicated than you think, especially when you consider the fact that beyond financing your retirement, you need to consider things like how you will pay for medical care, what you plan on doing with your current home, and how your assets will be distributed when you are gone. 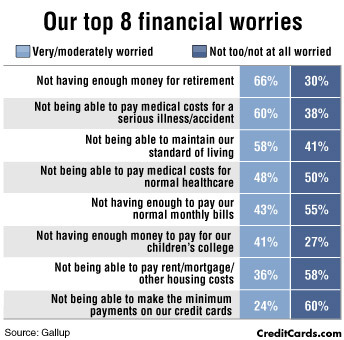 If thinking about the future makes you feel apprehensive, fear not—here is a brief list of the top financial concerns to think about as you get older, so that you can start (and continue) to prepare yourself to have stable finances as you hit retirement age. Hopefully you began thinking about retirement from a young age, because in reality it is something that you need to spend decades planning and preparing for. Retirement is an especially hot topic today because of the issue of social security, which refers to how the particularly large generation known as the Baby Boomers is reaching retirement age, while the smaller, younger generations who are now paying into the system are ill-equipped to support such a large generation of retirees. It is a cycle that may very well continue to repeat itself. (You can find more about this issue outlined in this article.) In short, all of this means that retirement should become a particularly pressing issue as you get older, and if by the time you hit your forties you aren’t taking significant action to prepare and plan for retirement, you definitely need to take action. Two of the most commonly used tools in estate planning are wills and revocable living trusts. Here is a brief look at how each can help you prepare financially for the future. Truth be told, it’s never too early to prepare a will, and doing so early on will only give you peace of mind as you prepare yourself for every possible scenario in life. It’s important to think about preparing a will especially as you get older because chances are you have accumulated assets over the years and have some wishes as to how those assets will be distributed after you die. Preparing a will can ensure that your assets are handled appropriately and that the probate process will go as smoothly as possible for your posterity. Two of the most common health fears among those growing in age are the fears of cognitive decline and losing memory. It makes sense, then, to prepare accordingly and to make a plan for how your finances will be handled should you become incapacitated during your lifetime. This is why so many people prepare living trusts (revocable living trusts being the most common), which are designed to provide instructions to a successor trustee on how your finances and assets are to be handled in such a situation. This is especially important when you consider that individuals tend to become increasingly uninhibited financially as they age (especially in their eighties and nineties), spending much more money on things than they normally would. They also tend to decrease in financial literacy. Moreover, there tend to be a great many more medical bills to deal with as you get older. Unsurprisingly, medical bills tend to increase as you get older, as well, making them a more and more pressing financial concern as you increase in age. There is Medicare, of course, but it typically won’t cover all of your medical expenses. In fact, Medicare tends to cover most acute conditions while not covering longer term care, such as care given at home, in assisted living facilities, and in nursing homes for lengthy illnesses and chronic disabilities. This is another reason why it’s so important to prepare well for retirement. Many senior-age Americans—60 percent, some estimate—haven’t changed residences in the past 20 years, and an even higher percentage plan on living in their current home for the rest of their lives. Homes, of course, require a great deal of upkeep, so if you intend on living in your current home for the rest of your life, then it’s important to consider how you are going to maintain that home as you get older. Chances are that you will have less capacity to perform do-it-yourself maintenance around the house and out on your property as you age, so you will likely have to outsource regular home maintenance, making maintenance cost more than you’re used to. In addition, you may very well need to make adjustments to your home in order keep it fully accessible, such as by installing a chair lift at your stairs. Other potential costs include lawn care and house cleaning. At what age is recommended to write a will? The most popular statistic age 57-62.